Marketed as a “biblically accurate biography”, I had some issues with this particular installment in the series. Although I understand the author’s intent to portray David as the “man after God’s own heart” role model that he was, I felt that there was not enough acknowledgement of his mistakes. For instance, the entire episode with Bathsheba and Uriah and the fact that David had many wives were both left out entirely. While these are not necessarily age appropriate fodder for 8-12 year olds, I think that some sensitive mention could be made regarding David’s struggle with sin; it seemed that David was written too idealistically. The biographical section of the book was, in my opinion, a bit confusing and dry for adolescents; the “clues” contained details critical to the story rather than shedding additional light on the narrative, and there was no real tie-in between David’s story and the reader until the power-ups section at the end of the book. 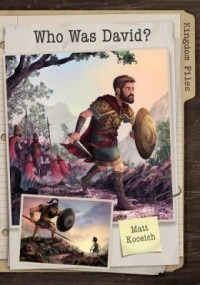 Engaging the reader in David’s life story would have made it more appealing and interesting, and including some basic maps along with the nicely-done illustrations would have dispelled some of the confusion of David’s often nomadic life. With all of that being said, however, I honestly did not entirely dislike this book. I think that with a few tweaks it could be as wonderful as some of the others in this series. As it is, I would highly recommend that adults read this story with their kids to answer questions and make things more clear, as well as to help with name pronunciation. This would make a nice study for Vacation Bible School or Sunday School, especially by using each of the ten “power-up” lessons and each one’s accompanying Bible verse as a guide and structuring in the relevant parts of David’s story with each.